Any Granbury resident or visitor can tell you that the historic sites in Granbury aren’t the only attraction! There are countless local eateries around town to satisfy whatever your palate desires. 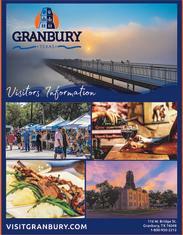 However, if you’re looking to dine in a historic building, head to the Granbury Square! Restaurants along the Square include Farina’s Winery and Cafe, Nutshell Eatery and Bakery, The Fillin’ Station, Babe’s Chicken Dinnerhouse, Christina’s Bistro, Ketzler’s Schnitzelhaus and Biergarten, 1890 Grill and Lounge, Paradise Bistro and Coffee Co., and Pearl Street Station. All of these locations are located right on the Historic Granbury Square, and each building comes with fascinating stories from its build and beginning roots in Granbury. These restaurants all vary in cuisine, and from fine dining to casual dining for the family.